Hey everyone. Friday is already upon us. To me right now it actually doesn’t make much of a difference. My daughter has been sick since Wednesday so all the day’s have been sort of mashing into one another! Had to bring her into the ER last night around midnight because she was in so much pain but apparently it’s only cold so we have to wait it out. My poor princess. Anyways, I hope your week is going better than mine so far! I can’t believe that school is starting soon! We start the day after labor day around here so we are blessed with quite a long summer. I have mixed feeling between my kids on going back. Honestly, I’m ready for them to go back. I have 3 boys besides my daughter, and they fight like cat’s and dog’s. My oldest will be a 5th grader, then we have a 3rd and finally a 1st grader. I can’t believe how big they are getting. Ugh, time goes by way to fast. But since it’s back to school time, it’s also time to start thinking about easy back to school meals! One of the easiest and kid friendly meals that my kids love is mac and cheese with hot dogs. Heck, I still love it. I like to give it a little twist though. Those blue boxes can still be amazingly good, especially the ones with the shapes but sometimes you just need a little more flavor and creaminess. That’s where homemade comes in to play! This is so cheesy you won’t know what to do with yourselves! Add a crispy panko crust and you have yourself a crunch creamy treat! So the next time your kids come home just famished after school whip this up for them! Pre-heat oven to 350. 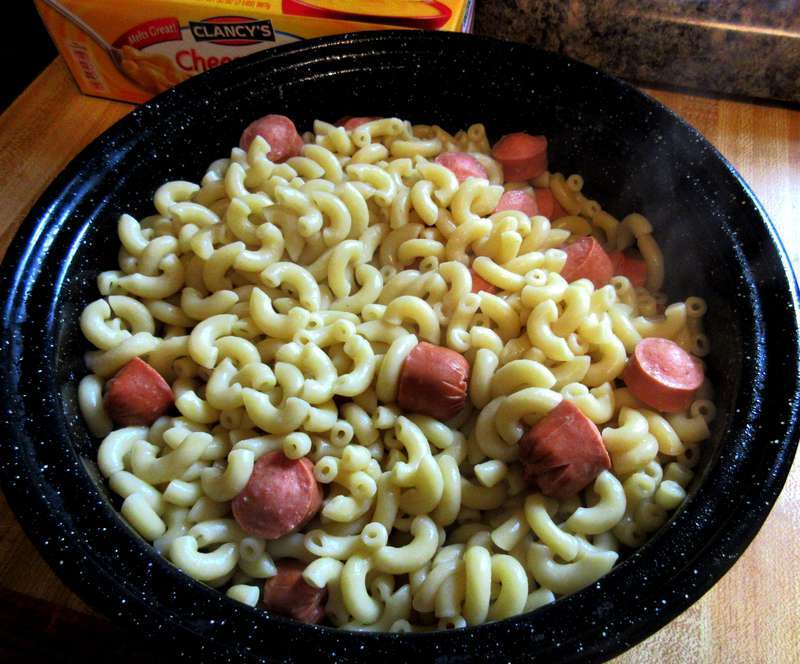 Cook pasta with hot dogs according to package directions, drain and pour into baking dish. In medium sauce pan, melt your butter. Once butter is melted stir in your flour then pour in you milk. Heat on medium heat, stirring occasionally until it thickened. 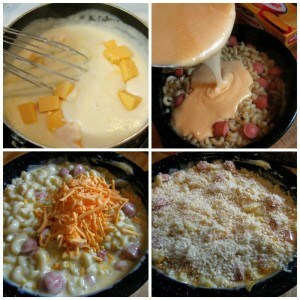 Once thickened add your Velveeta chunks and stir until melted. Pour your cheese sauce over your pasta and stir. Stir in your cheddar cheese until combined. Season with salt and pepper and top with desired amount of panko. Bake for about 20-30 minutes or until bubbly. Turn on broiler and broil a few minutes until panko is golden and crisp. Serve and enjoy! To see where I’m linked up at visit my Link Parties page and join the fun. Don’t forget to join us every Thursday at 6pm CST for Throwback Thursday’s link party! It’s so hard when our babies are sick! 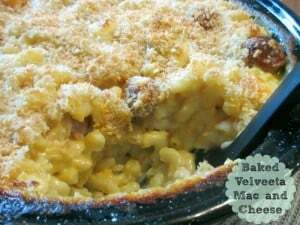 Who wouldn’t like some velveeta mac and cheese? It might even cure that cold? I hate sick kids so much and school hasn’t even started yet so their is surely more to come. 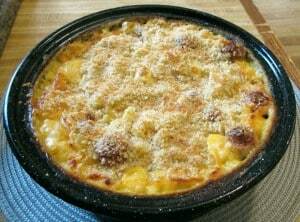 This Mac and cheese will cure everything, even this mamas heartache from her sick baby. Cheese is my therapy! Thanks for stopping by! I love this kid version. My mom used to make me this as a kid and switches it up with spam which we love. I’ve made an adult version of BBQ pulled pork too and we absolutely love it! Thanks for stopping by! Hi, Alli ~ This recipe sounds like the perfect comfort food for fall! Yum! Thanks for sharing at the Merry Monday Link Party! OMG I love Mac and Cheese! This is my youngest sons favorite dish! I am going to make this for him and retain my title as #Motheroftheyear! Thanks for linking up to Saucy Saturdays again! The Velveeta makes this. So creamy and cheesy and amazing for the kiddos (and mom). Thanks for stopping by!